1. A flood of fresh modern fabrics & designers hitting the market. Applying modern fabrics to age old blocks & patterns completely changes the look of a quilt and breathes new life into time tested patterns. 2. A resurgence of interest in the traditional skills e.g. quilting, knitting, dressmaking becoming more popular among the younger generations. 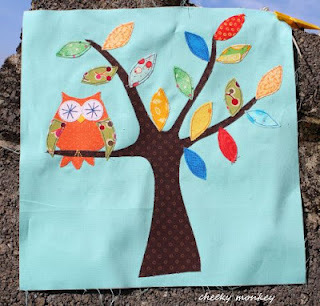 A new wave of creativity and ideas are coming through into quilting e.g. improv piecing, new blocks, working with solids etc., testing the boundaries of what you can and can’t do in quilting & sewing. She loves this quilt because even though it was for her nephew, he is a stylish and trendy young man, and allowed her to go with daring Kaffe Fasset colourful prints. She mixed in some of her stash/basics with it (love mixing old and new) and the Kona Ash sashing/grout added the final modern touch. 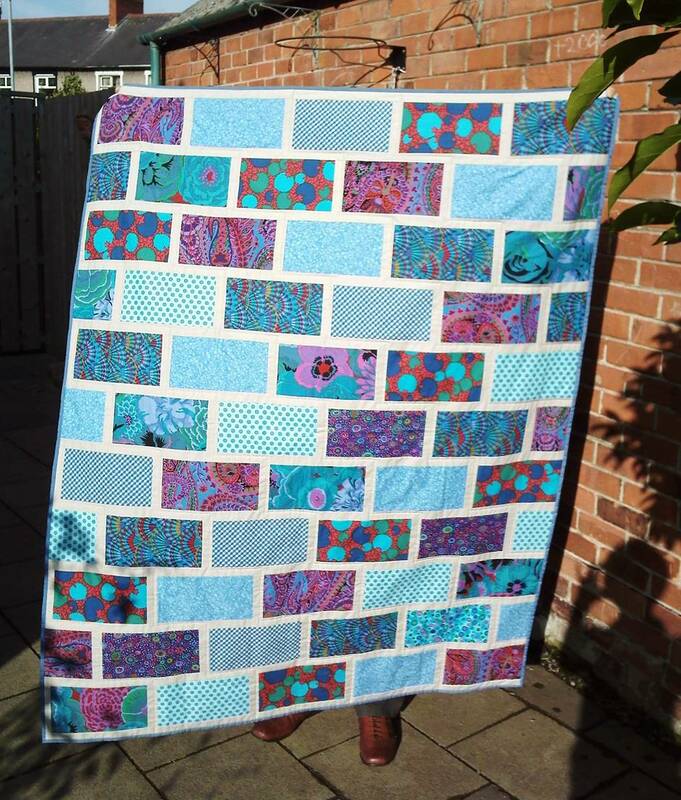 She also loves the colour brick pattern – it’s a great pattern for showing off lovely prints. The inspiration behind this quilt was her nephew, who is very modern and stylish, into the latest fashions, and not afraid to wear bright, bold colours. The deep aquas also match his bedroom colour scheme. 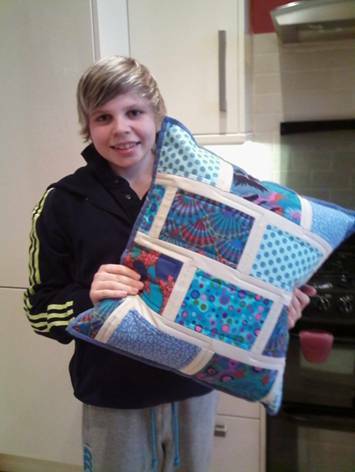 He adores his quilt, and now he also has a cushion to match! Anneliese, from Mail From the Cheeky Monkeys has just stared quilting, so she does not have many modern quilts of her own to share with us. 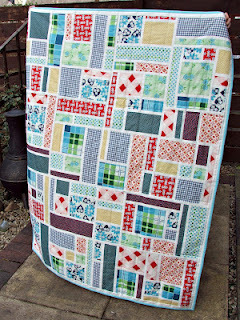 She likes the MQG Ireland group and all the lovely quilts, miniquilts, pouches, mug rugs, cushions, etc she finds on on this blog, but most of all she loves the colors. They are so bright and lovely! Most of the prints used are modern and fit perfectly. She likes to watch what is made out of these lovely fabrics and how they get together. The first books Anneliese got about quilting had boring colors or they had much to many dark colors, so she really enjoys having a look at the modern and fresh fabrics which are used. The stained quilt along from Domestic Light and Magic, made by Lynz. And she is proud of her gorgeous stash bee tree! Thanks Cindy, you got me by surprise! Just to be said: the quilt is finished and I have to thank Sarah (narcoleptic in a cupboard) and Sarah (FairyFace Designs) for their support!